Cue Card could to be aimed at the Ryanair Chase to be kept away from stablemates Thistlecrack and Native River in the Timico Cheltenham Gold Cup. Defeat to Thistlecrack in the King George on Boxing Day has persuaded trainer Colin Tizzard that the race Cue Card won at the Cheltenham Festival in 2013, and a drop back to 2m5f, could be the wise approach. Cue Card’s first try for two seasons over less than three miles is set to come in the Betfair Ascot Chase – which he won before landing the Ryanair – on February 18. The ten-year-old, who fell when going well in last season's Gold Cup, was made a top-priced 6-1 for the Ryanair by Coral. 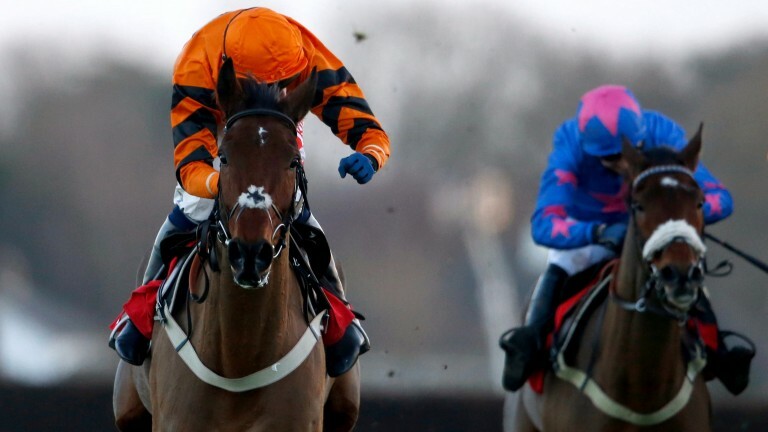 Tizzard said: “We’re definitely thinking of the Ryanair Chase. It’s up to the owners but I might send Cue Card to the Ascot Chase and the Ryanair Chase because I don’t really want Native River, Cue Card and Thistlecrack in the same race. I want to protect Cue Card. "Cue Card paid the penalty a bit for chasing Thistlecrack in the country. It was good for him to hang onto second. Reflecting on the King George and Thistlecrack, a best-priced 5-4 for the Gold Cup, he said: "He's the horse of everyone’s dreams. He’s got almost everything you’ve ever asked for in a horse, and he’s come out of this race better than any other he's run."